Nice book with simple stories to imagine how it was to live in a small town south of NZ in the 50s.Also beautiful illustrations to enjoy. Really enjoyed this. Gives a great insight to NZ life in the 1950s. By the time of my childhood 30 years later the train to Kingston and the Earnslaw had both been stopped as public transport, but both are still operating on shorter runs as tourist experiences on old-fashioned transport. When I was born, the road between Kingston and Queenstown was still unsealed, but even once they sealed it it was still a major cause of car-sickness for me. This book brought back many memories of my own childhood, as the places mentioned are all familiar to those years of my life. It has struck me recently that I must be getting old because so much of what was common place is now no more. It was the cover which drew me to the book. The story delivers a well paced recount of Gavin's years in Kingston touching on events that helped shaped him between the ages of 4 - 8. It is beautifully illustrated as to be expected. The story warmed me as I read and thought of how similar the everyday events seam to my own parents childhood in the 50s. I think this book would be an easy read for most children over 8 years with short chapters allowing children to pick it up for a moment, while others could read it in one sitting. The addition of a glossary is a great feature for those with a limited knowledge of 1950s New Zealand. I really enjoyed this and plan now to read it to my daughter. I loved this little Book. 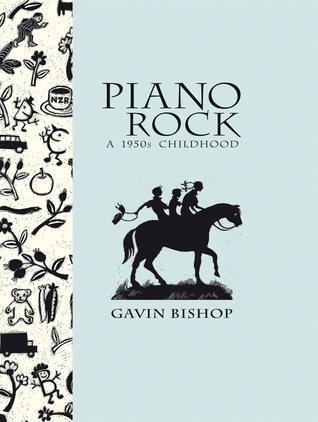 Gavin Bishop has evoked this little town in 50's NZ and with it his warm country childhood, with such clarity. Although I'm a 60's child, much - like Fielders Sponge Cake flour is full of memories. The subtle illustrations do just what they should - support, without detracting or taking over. Lovely. I'm not a big fan of the 1950s as "the good old days" but hard not to feel it here. The illustrations are lovely, Bishop is a fun kid, and all that baking! What's not to like?! NZ Post book award finalist. This was a quick read, I read it in one night.I love reading books that are based in New Zealand and especially awesome to be so close to home as a Southlander. Gavin Bishop Sarah Elworthy - Gavin Bishop is a highly acclaimed children’s book author and illustrator. Born in Invercargill, he spent his childhood in the remote railway settlement of Kingston on the shores of Lake Wakatipu. Studying under Russell Clark and Rudi Gopas, Gavin graduated from the Canterbury University School of Fine Arts with an honours degree in painting. He taught art at Linwood High School (now Linwood College) and at Christ’s College in Christchurch.He won the Margaret Mahy Medal in 2000, and has also won numerous other fellowships and national book awards. His book The House that Jack Built won the Book of the Year and Best Picture Book at the NZ Post Children’s Book Awards 2000. Weaving Earth and Sky won the non-fiction section and the Book of the Year Award of the NZ Post Children’s Book Awards 2003, and was shortlisted for the LIANZA Elsie Lock Medal in 2003. He has won the LIANZA Russell Clark Medal for Illustration four times. Among his successful partnerships has been that with writer Joy Cowley, with whom he won the Best in Junior Fiction and Book of the Year at the 2008 NZ Post Children’s Book Awards for Snake and Lizard.The Storylines Gavin Bishop Award for Picture Book Illustration was established in 2009 to encourage emergent illustrators and to acknowledge Gavin’s contribution to the writing and illustrating of children’s picture books. In 2013 he was made an Officer of the New Zealand Order of Merit, and President of Honour of the NZ Society of Authors, and he was the recipient of the 2013 Arts Foundation Mallinson Rendel Illustrator’s Award. Gavin’s artwork has featured in exhibitions internationally, including Japan and Czechoslovakia. He has written and designed two ballets for the Royal New Zealand Ballet Company: Terrible Tom and Te Maia and the Sea Devil. In 2003, during the Ursula Bethell Residency, he wrote and illustrated Giant Jimmy Jones, the world’s first three-dimensional animated picture book for HITLab at the University of Canterbury.